Every year, we end up seeing something new becoming a part of our normal life. It always starts out slowly. Developers, scientists, and visionaries are right now working on technologies we will only find out about in a few years. There are many technologies which have been in development for a long time and are finally reaching the maturity stage. Some of these are trends which have been on the rise for many previous years. 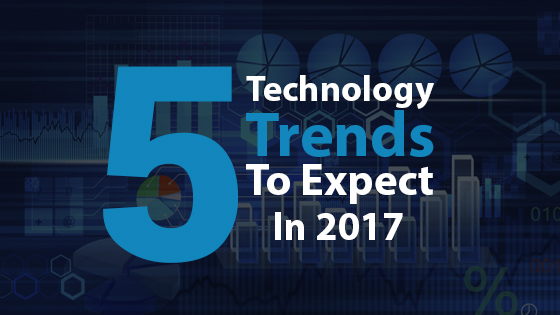 Let’s see the new technology trends that will dominate 2017. We have been hearing about the Internet of Things for more than a decade now. It was touted as the biggest technology of the future, and 2017 seems to be the year that will finally make it so. The Internet of Things has taken so long to mature because it depended on other technologies. These technologies acted as the building blocks we would need to make the IoT a reality. Now that wireless, automation, and the internet itself are mature enough to handle it, IoT devices are starting to become cheaper and more useful. We fully expect 2017 to be dominated by IoT apps, devices, and services. VR is already available to anyone who wanted it in 2016 thanks to the Vive and the Oculus Rift devices. One thing which has been holding a lot of people back is the high cost of a proper VR experience. You needed a high end computing machine along with the VR equipment which leads to a high cost, less accessible for the regular user. 2017 is the year that VR will become affordable. This will happen, in large part, due to consoles getting VR support. The PS4 already has a VR headset out and it offers VR at very affordable rates. As prices go down, owning a VR headset will become a no-brainer and VR entertainment will become more common. One of the biggest misconceptions people have about AR is that it is the same thing as VR. The reality couldn’t be more different. VR is about transporting you to other places, virtual realities. Augmented reality is about, well, augmenting reality with additional information. AR has the potential to be much more useful than VR. You can imagine an AR headset which gives you driving tips and guidance, one that allows surgeons to better see inside the human body as they make incisions, and one that allows repairmen to see the schema of the item they are repairing live. It opens up unforeseen avenues in design, engineering, and much more. Wearables have already become a part of the mainstream culture thanks to devices like the FitBit. Going forward, they will dominate an even larger share of the market. This was clearly seen when we saw the strong wearables presence at CES 2016 with many interesting devices announced for release in 2017. It might seem like a joke, but 2017 will be a very important year when it comes to the singularity. The singularity is often used in science fiction to represent a future where all technology is one and fully integrated with people. Look at the way technology is moving – automated vehicles, wearables, the Internet of Things, Augmented Reality, and you will notice that the bridge between digital and analog is getting shorter and shorter. In a few decades, we will have connected everything to each other and 2017 is just making the process faster. The future is going to be incredibly exciting – we just hope it is also as positive as we want it to be, and as unlike the dystopia science fiction seems to think it will be.